Hey, hey teachers!!!! It's summer and you are loving life, relaxing, enjoying all the free time you have.....except, let's be honest, all you are really doing is scowering Pinterest and Instagram to find pictures of classrooms and thinking about how you will decorate your classroom when it's time to go back to school. It's one of the best and worst things about being a teacher -- we love our time off, but we just cannot turn off the teacher brain. As much as we try to check out, it's still so exciting to plan and prep for a new school year. So my purpose for writing this post is to share some of the things I have learned over the years and through the many classrooms I have decorated. 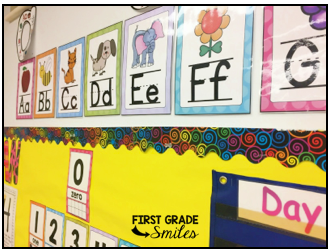 This post is dedicated to deciding how to decorate the walls and bulletin boards of your classroom. 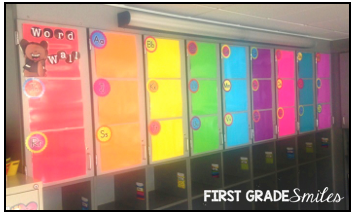 I will have more posts in this series about organizing teacher supplies and students supplies, so check back to see those. 1. As much as I love cute trends like pineapples and unicorns and would have so much fun filling my walls with all the adorable decorations that are out there, my first tip is to keep your decorating PURPOSEFUL. What will you and your students refer to throughout your days? What resources will help you teach? What resources will help your students learn and complete their work? If the only reason you're hanging it up is because it is pretty....don't! 2. You DO NOT need to fill every inch of wall space that is in your room. Do not make your walls so busy that your students are overwhelmed and can't find anything they are looking for anyway. Use the bulletin boards that you have and some of your wall space, but plan for some "white space" to let the eyes rest and to break up the different areas of your room. 3. 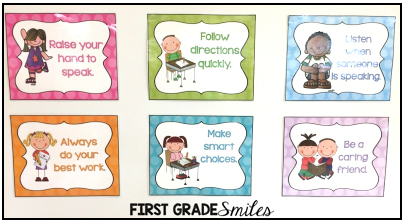 Let your curriculum help guide what you hang on your walls, but don't try to put everything they will be learning on the walls from day 1. 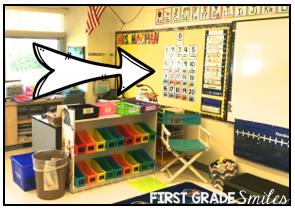 Leave an area where you could hang anchor charts you create together or vocabulary for a unit you are doing when you get to it. Allow your students to have some ownership over some things that go up. In my district we do not have to post standards or daily objectives, so I don't do that since my first graders (now my kindergarteners) can't read them anyway so who were they really for. 4. 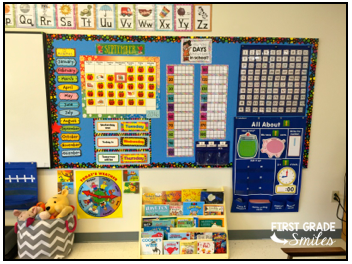 Don't forget to make spaces that will make the students feel that they are a part of this classroom and the classroom was made with them in mind. 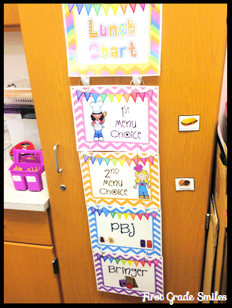 I hang up a birthday chart and a Star of the Week bulletin board. I also try to leave spaces for student work to be displayed. 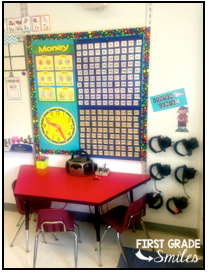 They will be spending about 1,000 hours in this classroom throughout the year --- you want it to feel like a special place to be! 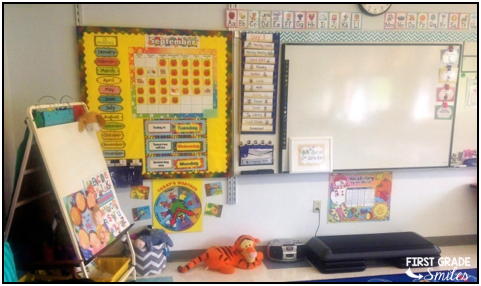 Here are some of the items that I know I personally need in my classroom when I have taught Kindergarten and First Grade along with a few pictures of some of my previous classrooms. 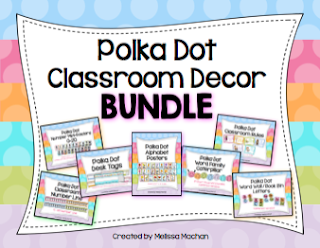 Click HERE to download a FREE K-1 Classroom Decor checklist to use yourself as you think about what you will hang up in your classroom. Calendar bulletin board that includes: monthly calendar, days of the week, months of the year, number of days we've been in school, and some other math resources that we use during morning meeting like number posters and a 100 or 120 chart (or sometimes I used a 180 chart if I had the room to count all the way through the year). 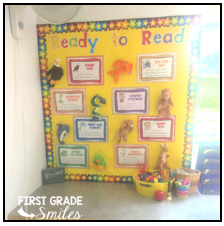 I try to keep this bulletin board right at my carpet area so we can go through it each morning together. This next classroom was very limited on bulletin board space. 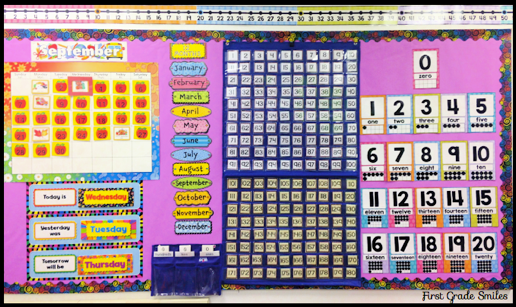 I only had two small bulletin boards in the front of the room, so I had to split up my calendar and math resources. You can also see in this picture that I hang up a visual schedule for the day as well. We go through the daily schedule each morning. This is my current Kindergarten classroom. You can see I moved the number posters off this board and added in some ten frames that we use along with the straws to count how many days we have been in school during our morning meeting. 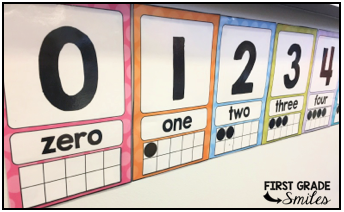 I will show you where the number posters have gone when they are not on my calendar board. 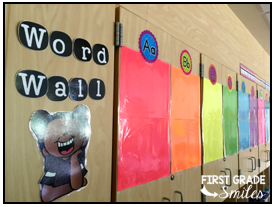 Word wall - I have had to get creative with my word walls over the years. 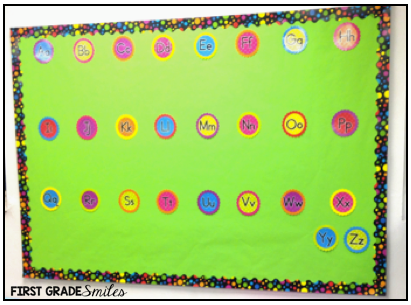 In some classrooms I would have a large bulletin board where I could put my word wall, but in my last 2 classrooms I have not had the space so I used the cabinets and some bright laminated cardstock. I actually like the cabinet word wall the best! Here is my current classroom. Alphabet - Depending on the letter formation you are responsible for teaching, it is important in a K-1 classroom to have an alphabet posted. I like to have mine right in the front of the room above the board. 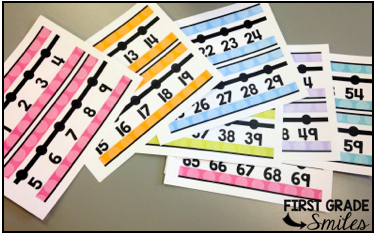 Math resources like a Number line and Number posters - I find that K-1 students need to see lots of different representations of numbers and how to use those to help count. 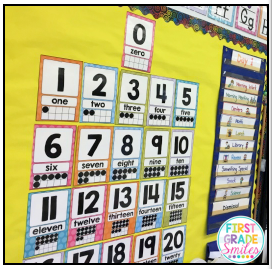 I hang up a classroom number line that I made that is color coded by tens so students can visually see each group of ten. And here are the number posters I hang up. 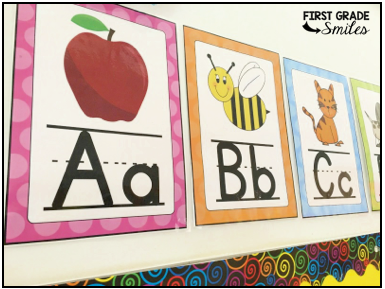 This first classroom had a large space on the wall that I used. This is how I had them the last two years -- on part of a bulletin board in the front of the room. 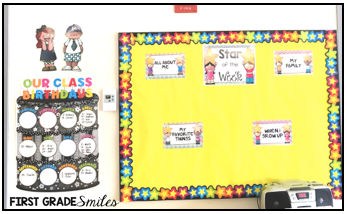 And for this upcoming year I have moved them below my board in the front of the room so children can come right up to them and count on them. Rules - I do like to create a classroom constitution in the beginning of the year, but inevitably these are the main rules we all come up with together anyway. The reason I think it's important to post rules is because I refer to these often when there is a behavior problem. When I speak with a student, I remind him/her of the rule that he/she is having a hard time with and what can be done to improve. It's always easier when there is a visual to refer back to. Remember though, you want your decor to be things you refer to and use, so if you post rules then try to refer to them from time to time so they have a purpose for being on your wall. Lunch count and/or attendance - This varies from school to school, but here is what my lunch chart looks like. Students use clothes pins to make their choice for the day. 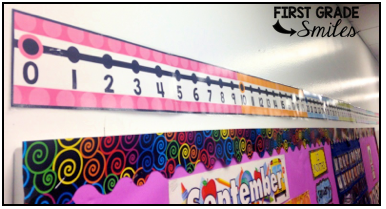 I do not have an attendance chart on the walls because I use the lunch chart as a way to quickly take attendance. 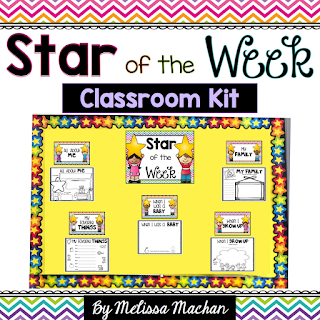 Special student areas like birthday charts, Star of the Week, etc. Space for student work - I don't have a bulletin board in my classroom for student work, but I do have them in the hallway. 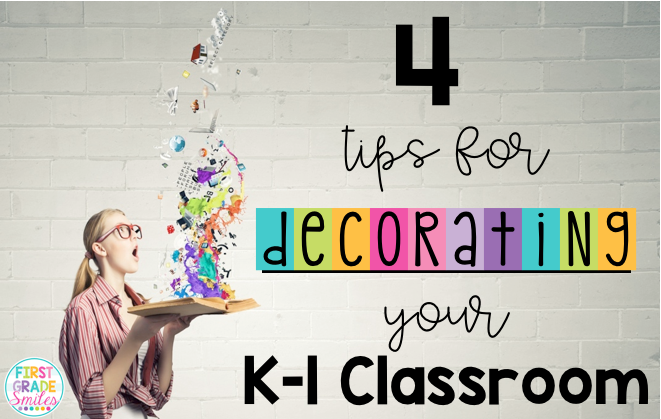 Typically I will hang student work from the ceiling (if I'm allowed because of fire code) or on the windows in my current classroom. 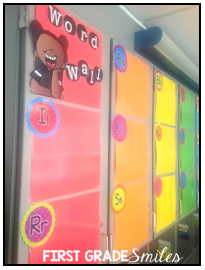 Other - Depending on the classroom I have put other things up on our walls if there was space and if it fit with my intentions, like this reading strategy bulletin board I had behind my guided reading table. I referred to this often as we would read, so it was definitely useful. Plus, my first graders LOVED the beanie babies!!! 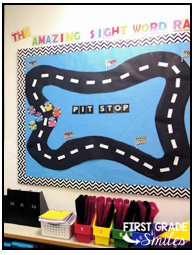 I also had this Amazing Sight Word Race track up in one of my first grade classrooms that had a ton of bulletin boards (and only one tiny window, so that's probably why). 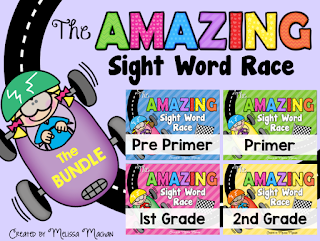 I used this as an incentive to learn sight words throughout the year but since it was going around the track multiple times, the kids didn't always know which lists the other students had mastered - they were only racing themselves. 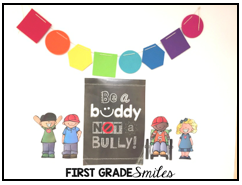 And finally, I do like to have at least one space to talk about kindness, character ed, or bullying. I really like this poster paired with some Melonheadz kids so I have this in a little space on my wall in my classroom right now. I know what you're thinking - I should have kept it as white space, and you might be right, but I really enjoy watching the kindergarteners throughout the year as they learn to read what this poster says and hopefully put it into practice. 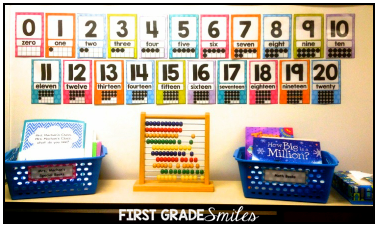 If you are looking for more tips for Back to School and Classroom organization.....check the next post in the series: 4 Tips for Organizing you Teacher Supplies. Sign up to receive emails when I make a new blog post to see future posts about organization as well.